Losing hair is quite traumatic for adults, so imagine when it happens with children. While hair loss is difficult to handle for the young ones, it is up to the adults to understand what is causing it, how it can be treated or handled in the most effective manner. Alopecia areata: Although a non-contagious condition, alopecia areata is said to be caused when the immune system of the body, attacks the hair follicles, causing hair loss. You might notice the sudden appearance of bald patches, which are smooth to touch. There is no real cure for the condition, but it can be controlled with proper treatment. In many cases, there has been complete hair regrowth in a matter of months, but in several other cases, the new hair also falls off. Alopecia totalis and alopecia universalis: This condition is similar to alopecia areata, but the hair loss is more extensive. For instance, in alopecia totalis, the hair loss is all over the head, and in alopecia universalis, the hair loss is all over the body. If your child is suffering from either one of the conditions, the chances of successfully treating the same are less. Tinea capitis: This is actually a fungal infection that is seen quite commonly in children. There are numerous manners in which it presents itself, but the most common one is loss of hair and appearance of scaly patches. The hair will most probably break off at the skin surface and there will be black dots on the scalp. 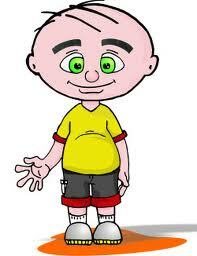 Trichotillomania: This type of hair loss is caused when the child pulls or plucks his or her own hair. One will be able to notice the condition by uneven lengths of hair or patchiness. Most often, the patches are noticed on the side of the head, which corresponds to the dominant hand of the child. In many cases, the condition could be triggered due to stress or anxiety. Telogen effluvium: When there is sudden stress in the form of very high fever, traumatic experiences such as death of a loved one or an accident, or a surgical process, there could be hair loss. Such a condition is called telogen effluvium and in it, the hair follicles get stuck in the telogen phase. From here, they directly fall, which eventually leads to the baldness. However, this is not known to be a permanent condition and hair does grow back in a few weeks or months. Nutritional deficiency: Not eating a proper diet can certainly lead to hair loss. If there is a deficiency of vitamin H (biotin) or zinc, there can be extensive hair fall. Similarly, if there is too much vitamin A in the body, there can be hair loss. Endocrinal issues: In some children, there is a condition called as hypothyroidism, wherein the thyroid is not as productive as it should be. With insufficient thyroid in the body, the metabolism is not regulated properly and that leads to hair loss. Non-medical causes: There are also numerous non-medical causes, including tight hair styles and newborn babies rubbing their head against the crib. These are however, temporary hair loss conditions and can be rectified quite easily. Alopecia areata: Cortisone has proven effective in treating alopecia areata and the same can either be injected or applied in the form of ointments. Slightly older children might also benefit from steroid injections or Minoxidil. Alopecia totalis and alopecia universalis: Treatments used for alopecia areata can be used, in addition to ultraviolet light therapy or even cyclosporine. Tinea capitis: Since this is a fungal infection, antifungal medications are the best way of treating the same. These could be oral or topical, but either will have to be prescribed by a doctor. In addition, it would be advised that the child wash his or her hair with a selenium sulphide shampoo. Trichotillomania: There would be no use of scolding the child, but it would be a good idea to take the child for a counselling session. If the condition has been caused due to anxiety or stress, talking to a counsellor could resolve it. Telogen effluvium: The most common treatments include the usage of topical steroids and keeping the scalp clean. Nutritional deficiency: Quite obviously, eating healthy would be the way out of this condition. Ensure your child has enough nutrients in his or her daily diet and if the condition has been caused due to excessive vitamin A, simply cut the intake of the same. Endocrinal issues: If there is a thyroid related problem, the doctor would be able to suggest a corrective course of treatment. The doctor would also be able to suggest a more appropriate diet, assesing the metabolic rate. A child losing hair would certainly lead to mental disturbance, which is why, as a parent you will have to tread very carefully. Ensure you instil confidence in the mind of your child, allowing him or her to understand that hair is just a part of the body. In addition, it would be a good idea to talk to the teachers and classmates to ensure that no one makes fun of your child. If the hair loss is too extensive, it would be prudent to invest in a natural looking wig.